A large shard of white quartz embossed with copper wires is plated with silver in this striking pendant. Or alternatively could be worn as a brooch on a pin. A large shard of white quartz embossed with copper wires is plated with silver in this striking pendant. Dramatic setting on a simple sterling silver chain. Or alternatively could be worn as a brooch on a pin. 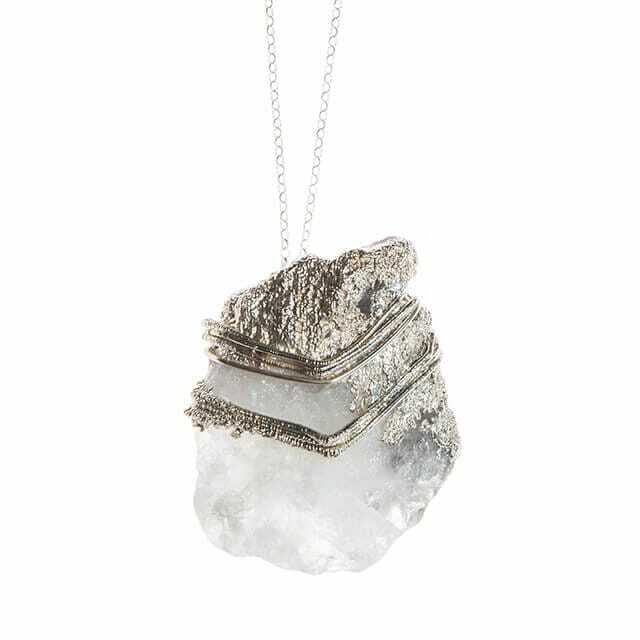 The crystalline qualities of quartz are contrasted with silver in this unusual large pendant. First, copper was plated onto the stone and wire using the technique of electroforming, which deposits metal by passing an electric current through a conductive solution. Then the metal was over-plated in silver. This piece is part of a collection inspired by the larger experiments of American land-artist Robert Smithson. In the 1970s he poured asphalt, glue, rubble and other materials upon quarries, buildings and hillsides as comments on natural chaos, decay and geological forms.